Snakebite Symptoms by Häggström, Mikael. “Medical gallery of Mikael Häggström 2014”. Wikiversity Journal of Medicine 1 (2). DOI:10.15347/wjm/2014.008. ISSN 20018762. , via Wikimedia Commons. CLICK TO ENLARGE! (1) In most cases, almost immediate SWELLING and EDEMA appear. Swelling is usually seen around the injured area within five minutes after the bite and often progresses rapidly, involving the entire injured extremity within an hour. Generally, however, edema spreads more slowly over a period of 8 to 36 hours. (2) Swelling is most marked after bites by the eastern diamondback rattlesnake. It is less marked after western diamondback bites, and after bites by the prairie, timber, red, Pacific, and black-tailed rattlesnakes, sidewinders and cottonmouths. It is least marked after bites by copperheads. B. PAIN: Immediately following the bite is a complaint of most patients with poisoning by rattlesnakes. It is most severe after eastern and western diamondback bites, less severe after bites by the prairie and other viridis rattlesnakes, and least severe after copperhead and massasauga bites. WEAKNESS, SWEATING, FAINTNESS and NAUSEA are common. a. May include punctures, pain, edema, erythema, bleeding, ecchymosis, and lymphangitis. a. May include hypotension, weakness, sweating or chills, perioral and/or peripheral paresthesia, taste changes, nausea and vomiting, and fasciculations. Coagulopathies and shock may occur in some envenomations. a. Minimal reaction, punctures may be obscure. a. May include drowsiness, weakness, dysphagia, dysphonia, diplopia, headache, weakness, and respiratory distress. A. The following immediate procedures should be carried out: typing and cross-matching, bleeding, clotting and clot retraction times, complete blood count, hematocrit, platelet count and urinalysis. B. RBC indices, sedimentation rate, prothrombin time, arterial blood gases, sodium, potassium and chloride determinations may be needed. A. 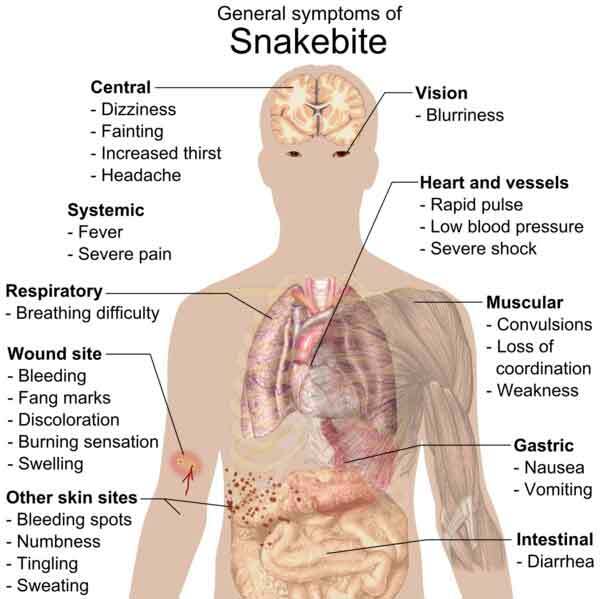 This overview contains first aid treatment for snake bite only. See main section of management for assessment and therapy guidelines. 1. Put victim at rest and keep warm. 2. Remove rings and constrictive items. 3. Lightly immobilize injured part in functional positional and keep just below heart level. 4. Give plenty of reassurance. 5. Transport to medical facility as quickly as possible. 6. Do not pack in ice. 7. Use Sawyer Extractor over bite area if transport to medical facility is to be in excess of 45 minutes. Must be applied immediately. 8. Electroshock treatment for snake bite has been recommended as initial therapy, but this unusual recommendation has been demonstrated to be ineffective in an animal model and is potentially quite dangerous. A. There are approximately 120 species of snakes in the United States of which 26 are venomous. Bites by nonvenomous snakes are much more common than bites by venomous snakes. These should be treated as simple puncture wounds, employing an appropriate antitetanus agent. About 25% of all bites by venomous snakes in the United States do not result in envenomation, that is, the snake may bite but not inject venom, or may eject it onto the skin, as in a very superficial bite. 7) The kind of first aid treatment and subsequent medical care. C. Bites by venomous snakes may therefore vary in severity from trivial to extremely grave. In every case, snake venom poisoning is an emergency requiring immediate attention and the exercise of considerable judgement. Delayed or inadequate treatment for snake bite may result in tragic consequences. However, failure to differentiate between the bite of a venomous and a nonvenomous snake may lead to the use of measures that can not only cause discomfort but may produce deleterious results. D. It is essential that a diagnosis, based on identification of the snake and the presence or absence of symptoms and signs, be made before treatment for snake bite is instituted. The admitting diagnosis should indicate whether the patient has been bitten and envenomated by a venomous snake (snake venom poisoning), bitten but not envonomated, or bitten by a nonvenomous snake. E. “Snakebite” is not a valid medical-legal diagnosis. 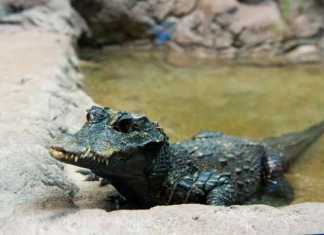 The identity of the offending reptile, when obtainable, should be noted on the admitting record. It should be borne in mind that some persons bitten by nonvenomous snakes become excited and even hysterical, and that these findings may give rise to disorientation, faintness, dizziness, hyperventilation, a rapid pulse, and even primary shock. 1. Identification of a venomous species is not always easy. The rattlesnakes are distinguished from the nonvenomous snakes by their two elongated, canaliculated, upper maxillary teeth, which can be rotated from their resting position, in which they are folded against the roof of the mouth, to their biting position, where they are almost perpendicular to the upper jaw. Each fang is shed periodically and is replaced by the first reserve fang. The pupils are vertically elliptical, but a few nonvenomous snakes also have such pupils. The crotalids have a deep easily identifiable pit between the eye and the nostril. The somewhat triangular shape of the head, the base being wider than the neck, also helps to distinguish them from nonvenomous snakes. 2. Color and pattern are the most deceptive criteria for identification. Identification of the offending snake on the sole basis of fang or tooth marks is not recommended. Some nonvenomous snakes may leave teeth marks very similar to those produced by rattlesnakes and rattlesnakes may leave teeth marks in addition to those of the two upper maxillary fangs. Very often, crotalids may strike and leave a single fang puncture wound and this is too similar to that which might be produced by a nonvenomous snake to be relied upon in confirming a diagnosis. 3. CORAL SNAKE: The coral snake’s upper maxillary teeth are also elongated but they are much shorter than those of the rattlesnakes, and they are fixed. Coral snakes have round pupils, and can be distinguished from king snakes, scarlet snakes and some shovel-nosed and milk snakes, with which they are sometimes confused, by their complete rings of black, yellow and red, the red and yellow ring touching. “Red on yellow kill a fellow”. 1. Snake venoms are complex mixtures, chiefly proteins, many of which have enzymatic activities. However, the lethal and perhaps more deleterious fractions are certain peptides and proteins of relatively low molecular weight. 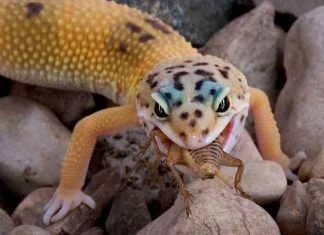 Some of these peptides may be 25 times more lethal than the crude venom. These peptides appear to have very specific receptor sites, both chemically and pharmacologically. 2. Snake venoms are also rich in enzymes, including: proteinases; phospholipase A, B., C, and D; ATPase; L-arginine-ester hydrolases; ribonuclease; alkaline phosphatase; transaminase; deoxyribonuclease; acid phosphatase; hyaluronidase; phosphomonoesterase; DPNase; L-amino acid oxidase; phosphodiesterase; endonuclease; cholinesterase; and 5′-nucleotidase endonuclease. The venoms of the crotalids are rich in some of these enzymes, while poor in others. 3. Although the peptides of the North American rattlesnakes have not yet been studied in detail, preliminary investigations indicate they are 3 to 10 times more lethal than the crude venom, and have molecular weights around 10,000. Several larger lethal proteins have also been isolated but their exact composition has not yet been determined. 1. In most cases, almost immediate SWELLING and EDEMA appear. Swelling is usually seen around the injured area within five minutes after the bite and often progresses rapidly, involving the entire injured extremity within an hour. Generally, however, edema spreads more slowly over a period of 8 to 36 hours. 2. Swelling is most marked after bites by the eastern diamondback rattlesnake. It is less marked after western diamondback bites, and after bites by the prairie, timber, red, Pacific, and black-tailed rattlesnakes, sidewinders and cottonmouths. It is least marked after bites by copperheads. C. REGIONAL LYMPH NODES may be ENLARGED, PAINFUL, and TENDER. and MUSCLE FASCICULATIONS may be seen (Russell, 1983). A. PARESTHESIA: A common complaint following some pit viper bites is TINGLING or NUMBNESS over the TONGUE and MOUTH or SCALP, and PARESTHESIA around the wound. This may appear within 5 minutes of the bite. A. Hematological findings may show HEMOCONCENTRATION early, then a DECREASE in RED CELLS and PLATELETS. Urinalysis may reveal HEMATURIA, GLYCOSURIA and PROTEINURIA. The clotting screen is often abnormal. A. ECCHYMOSIS and DISCOLORATION of the SKIN often appear in the area of the bite within several hours. VESICLES may form within 3 hours; generally they are present by the end of 30 hours. HEMORRHAGIC VESICULATIONS and PETECHIAE are common. B. THROMBOSIS may occur in superficial vessels, and SLOUGHING of INJURED TISSUES is not uncommon in untreated cases. NECROSIS develops in a large percentage of untreated victims. C. SKIN TEMPERATURE: Is usually ELEVATED immediately following the bite. A. The following immediate procedures should be carried out: typing and cross-matching, bleeding, clotting and clot retraction times, complete blood count, hematocrit, platelet count and urinalysis. RBC indices, sedimentation rate, prothrombin time, arterial blood gases, sodium, potassium and chloride determinations may be needed. B. Serum proteins, fibrinogen titer, partial thromboplastin time, and renal function tests are useful. C. In severe envenomations the hematocrit, blood count, hemoglobin concentration, and platelet count should be carried out several times for the first few days, and all urine samples should be examined, particularly for red blood cells. A. In severe poisonings, an electrocardiogram is indicated. A. Riggs et al (1987) reported the case of a 29 year old man with no prior history of snakebite, who was bitten on the left index finger by a rattlesnake. The patient had performed incision and oral suction before seeking medical attention. He also had recent dental surgery and gingival irritation and mucosal breaks. Mild edema from the bite site to the wrist and a mild coagulopathy developed. The most striking feature was massive oropharyngeal edema with dyspnea, wheezing, and inability to speak, which occurred before any antivenin was administered. The massive oropharyngeal swelling may have been due to absorption of venom through the injured gingival mucosa and brings the safety of incision and oral suction into question. 5.1 LIFE SUPPORT Support respiratory and cardiovascular function. 8. Electroshock treatment for snake bite has been recommended as initial therapy (Guderian et al, 1987), but this unusual recommendation has been demonstrated to be ineffective in an animal model (Howe & Meisenheimer, 1988) and is potentially quite dangerous (Russell, 1987). 1. Distinguish between venomous or nonvenomous snake, other animal bite, or plant thorn injury. 2. Determine where, when, and under what conditions injury occurred. 3. Establish time and sequence of manifestations. a. TRIVIAL ENVENOMATION: Manifestations remain confined to or around the bite area. No systemic symptoms or signs. No laboratory changes. b. MINIMAL ENVENOMATION: Manifestations confined to area of bite, with minimal edema immediately beyond that area. Perioral paresthesia may be present, but no other systemic symptoms or signs. No laboratory changes. c. MODERATE ENVENOMATION: Manifestations extend beyond immediate bite area. Significant systemic symptoms and signs. Moderate laboratory changes; ie, decreased fibrinogen and platelets, and hemoconcentration. d. SEVERE ENVENOMATION: Manifestations involve entire extremity or part. Serious systemic symptoms and signs. Very significant laboratory changes. (1) The method of grading rattlesnake bites by numbers on the basis of selected symptoms and signs is inadequate. Every finding should be considered in determining the severity of the poisoning. Pain, swelling, ecchymosis and local tissue changes may be absent or minimal, even after a lethal injection of some rattlesnake venoms, and these findings are too commonly employed as the sole guides for grading the envenomation. (2) For that reason, poisoning should be noted as trivial, minimal, moderate or severe, bearing in mind all clinical manifestations, including changes in the blood cells and blood chemistry, deficiencies in neuromuscular transmission, changes in motor and sensory function, and the like. 5. Evaluate status of preadmission treatment. If tourniquet or tight band has inadvertently been placed, apply less constricting band proximal to tourniquet, start IV infusion of a crystalloid solution, remove tourniquet slowly, and observe. 1. To be effective, treatment must be instituted immediately. 2. Start IV infusion of crystalloid solution (eg, lactated Ringer’s or sodium chloride, USP). If shock or severe bleeding present, consider colloid solutions, plasma or whole blood. 3. Cleanse wound with soap and water. 4. Loosely immobilize affected part at heart level and in functional position. 5. Keep patient at rest and give reassurance. 6. Give antitetanus agent for tetanus prophylaxis. 7. When patient is stable, give appropriate analgesic, if indicated. 8. Administer sedative to produce mild sedation, if necessary. 9. Under no conditions should injured part be placed in ice, the bite area excised, nor should a fasciotomy be performed at this time. 1. The importance of early antivenin administration, preferably intravenously, cannot be overemphasized. The amount to be used will depend upon the species and size of snake, the site of envenomation, the size of the patient and other factors. Poisoning by water moccasins usually requires lesser doses, whereas in copperhead bites, antivenin therapy is usually required only for children and the elderly or severely envenomated. 2. Recent studies indicate efficacy of antivenin when given within 4 hours of a bite; it is of less value if delayed for 8 hours, and questionable value after 26 hours. However, it seems advisable to recommend its use up to 30 hours in all severe cases of crotalid poisoning. 3. When the offending snake is an imported species, the physician should consult the nearest Poison Control Center for guidance on the availability and choice of antivenin. The larger zoos of the country usually stock supplies of antivenins and have emergency programs for dispensing them, and addresses of consulting physicians. 4. Skin test (See antivenin brochure). If positive, patient should be treated in an intensive care setting, if antivenin is necessary to save life or limb. 5. Administer Antivenin (Crotalidae) Polyvalent IV in dilution, initially at a slow rate and then at a faster rate (15 to 20 minutes per vial) if no reaction occurs. a. Minimal envenomation 5 to 8 vials; moderate 8 to 12; severe 13 to 30+. No antivenin is indicated in trivial bites. b. To administer, dilute each vial to 50 to 200 ml (eg, 5 vials in 250 to 1000 ml diluent), and give intravenously by continuous infusion. Reduce volume of diluent as required in pediatric patients. c. Attempt to give total dose during first four to six hours. d. Use after 24 hours to reverse coagulopathy. 6. Administer North American Coral Snake Antivenin (Micrurus fulvius) IV in continuous drip. a. If there is a definite bite, 3 to 5 vials in diluent (eg, 250 to 500 ml of sodium chloride injection, USP) should be given as early as possible. b. If symptoms and signs develop, 3 to 5 additional vials should be administered, and more as indicated. 7. If necessary to administer IM, give in buttocks. DO NOT give IM unless IV administration is absolutely impossible. 8. Never inject antivenin into a toe or finger. 9. If patient has a reaction to the antivenin, discontinue its use for 5 minutes, give diphenhydramine IV, and then start antivenin more slowly under close observation, and with shock cart at hand. If a further reaction occurs, discontinue antivenin and seek consultation. 10. Measure circumference of involved part just above bite and 10 and 20 cm above this point. Record every 15 minutes during antivenin administration and every 1 to 2 hours thereafter to document edema. 11. Have tourniquet, oxygen, epinephrine, shock drugs, tracheostomy equipment and positive-pressure breathing apparatus available. 1. Observe patient for minimum of 4 hours in all cases of snakebite. 2. DO NOT leave patient unattended. 4. Heparin is not recommended for coagulopathies. 5. Broad spectrum antibotic if severe tissue involvement. 6. Plasma, albumin, whole blood or platelets, as indicated. 7. Limit IV fluids during period of acute edema. 8. Liquid or soft diet, as tolerated. 10. Oxygen or positive-pressure breathing as necessary. 11. Antihistamines or steroids to treat allergic reactions to antivenin or venom. DO NOT USE STEROIDS DURING ACUTE PHASE OF POISONING, except in conditions of shock or severe allergic reactions. 1. Cleanse and cover wound with sterile dressing. 2. Debridement, if necessary, third to tenth day. Elevate extremity slightly if swelling is severe and there are no systemic manifestations or abnormal laboratory findings. 3. Soak part for 15 minutes 3 times daily in 1:20 Burow’s solution. 4. Paint wound twice weekly following debridement with an aqueous dye of brilliant green 1:400, gentian violet 1:400, and N-acriflavin 1:1000. Apply antimicrobial cream (Neomycin or similar) at bedtime. 5. Physical therapy evaluation on 3rd or 4th day; start active exercise immediately. A. Observe patient for minimum of 4 hours in all cases of snakebite. A. The common practice of dividing snake venoms into such groups as neurotoxins, hemotoxins, cardiotoxins and the like, has led to much misunderstanding and to grave errors in clinical judgement. Chemical, pharmacological and clinical studies have shown these divisions to be both superficial and misleading. B. 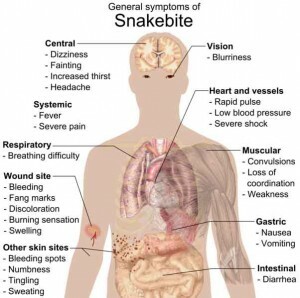 Snake venoms are complex mixtures and the physician attending a patient with snake venom poisoning must remember that he is faced with a case of multiple poisoning, perhaps three or more toxic reactions, with pharmacological changes that may occur simultaneously or consecutively. C. It should also be remembered that the effects of various combinations of the venom components, and of metabolites formed by their interactions, can be complicated by the response of the victim. The release of autopharmacological substances by the envenomated patient may complicate the poisoning and make treatment more difficult. D. The venoms of pit vipers produce deleterious local tissue effects, changes in blood cells, defects in coagulation, injury to the intimal linings of the vessels and changes in blood vessel resistances. The hematocrit may fall rapidly and platelets may disappear. Pulmonary edema is common in severe poisoning and bleeding phenomena may occur in the lungs, peritoneum, kidneys and heart. These changes are often accompanied by alterations in cardiac dynamics and renal function. E. Most of our crotalid venoms produce relatively minor changes in transmission at the neuromuscular junction, the notable exception being the venom of the Mojave rattlesnake, which also produces far less tissue destruction. The early cardiovascular collapse seen in an occasional patient bitten by a rattlesnake is due to a marked fall in circulating blood volume. Although cardiac dynamics may be disturbed, in most cases the heart changes may be secondary to the decrease in circulating blood volume. F. Coral snake venom causes more marked changes in neuromuscular transmission and in conduction in nerves, but death may occur from cardiovascular collapse quite apart from the neurotropic changes. 1. Conant R: Field Guide to Reptiles and Amphibians. Houghton Mifflin, Boston, 1958. 2. Dowling H, Minton SA & Russell FE: Poisonous Snakes of the World, U.S. Government Printing Office, 1968. 3. Garfin SR, Castilonia RR & Mubarak SJ: The effects of antivenin on intramuscular pressure elevations induced by rattlesnake venom. Toxicon 1985; 23:677-680. 4. Guderian RH, MacKenzie CD & Williams JF: High voltage shock treatment for snake bite (letter). Lancet 1986; 2:229. 5. Howe NR & Meisenheimer JL Jr: Electric shock does not save snakebitten rats. Ann Emerg Med 1988; 17:245-256. 6. Jimenez-Porras JM: Biochemistry of snake venoms. Clin Toxicol 1970; 3:389. 7. Klauber LM: Rattlesnakes, Univ Calif Press, Berkeley, 1956. 8. Lee CY: Snake Venoms, Springer, Berlin, 1979. 9. McCullough N & Gennaro J: Evaluation of venomous snakebite in the southern United States from parallel clinical and laboratory investigations. 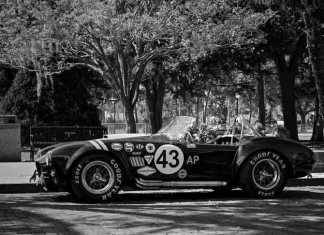 J Fla Med Assoc 1963; 49:959. 10. Minton SA: Venom Diseases. C.C. Thomas, Springfield, Illinois, 1974. 11. Picchioni AL et al: Snake Venom Poisoning (chart), American Association of Poison Control Centers and American College of Emergency Physicians, 1984. 12. Picchioni AL, Hardy DL, Russell FE et al: Management of poisonous snakebite. Vet Hum Toxicol 1984; 26:139-140. 13. Riggs BS, Smilkstein MJ, Kulig KW et al: Rattlesnake evenomation with massive oropharyngeal edema following incision and suction (Abstract). Presented at the AACT/AAPCC/ABMT/CAPCC Annual Scientific Meeting, Vancouver, Canada, September 27-October 2, 1987. 14. Russell FE: Snake venom poisoning, In: Cyclopedia of Medicine, Surgery & the Specialities, Persol, G.M. (Ed), F.A. Davis, Philadelphia, 1971. 15. Russell FE: Snake Venom Poisoning. JB Lippincott, Philadelphia, 1980; Scholium International, Great Neck, NY, 1983. 16. Russell FE: A letter on electroshock for snakebite. Vet Hum Toxicol 1987; 29:320. 17. Russell FE & Brodie: Venoms of reptiles, In: Chemical Zoology, Vol IX, Academic Press, New York, 1974. 18. Russell FE & Puffer H: Pharmacology of snake venoms. Clin Toxicol 1970; 3:433. A. Wyeth Laboratories maintains a national 24-hour emergency medical information number at (215) 688-4400. They will accept collect calls in an emergency situation. 1. Richard W. Carlson, M.D., Ph.D., Mount Carmel-Mercy Hospital and Medical Center, 6071 W. Outer Drive Detroit, Michigan 48235. 2. Roger Conant, Sc.D., Biology Department, University of New Mexico, Albuquerque, New Mexico 87131 (for identification of snakes). 3. David Hardy, M.D., Route 15, Box 259, Tucson, Arizona 85715. 4. L. P. Laville, Jr., M.D., The Baton Rouge Surgical Group, Doctors Plaza, 3955 Government Street, Baton Rouge, Louisiana 70806. 5. Lawrence Leiter, M.D., 21530 W. Golden Triangular Road, Saugus, California 91350. 6. Sherman A. Minton, Jr., M.D., Indiana University Medical Center, 1100 West Michigan Street, Indianapolis, Indiana 46207, (317) 264-7671 or 264-7842 (office), (317) 849-2596 (home). 7. Findlay E. Russell, M.D., Ph.D., Department of Pharmacology and Toxicology, College of Pharmacy, University of Arizona, Tucson, Arizona 85721. 8. L.H.S. Van Mierop, M.D., Department of Pediatrics, University of Florida, College of Medicine, Gainsville, Florida 32610. 9. Charles H. Watt, M.D., 900 Gordon Avenue, Thomasville, Georgia 31792. 10. S. R. Williamson, M.D., 307 Medical Tower, Norfolk, Virginia, (804) 625-7406 (804) 484-7151. 11. Willis A. Wingert, M.D., Univ. of So. Calif. Med. Center, 1129 N. State Street, Los Angeles, California 90033, (213) 226-3600 (714) 626-3935. Previous articleThe King Cobra Habitat – Where Will You Find Him?